Never tried stuffing a tomato before? Try some of these healthy and low-fat recipes for vegetarian stuffed tomatoes (many—though not all—of these recipes are dairy-free and vegan as well). You could also try using these recipes to make stuffed bell peppers instead of tomatoes, though you may need to increase the quantity of the stuffing in order to fill the peppers. Another great tip: if you cannot get your stuffed tomatoes to stand up in the baking pan, try placing them in a lightly greased muffin tin if they are small enough. Once in a muffin pan, the tomatoes can stand up perfectly and not collapse—it really works. When making stuffed tomatoes, how much to stuff into a tomato is really a personal preference, and may depend on how juicy your tomatoes are. Fresh and somewhat firm beefsteak tomatoes are best for stuffing, but really almost any kind will do. If you do not want to follow a recipe, you can try using just about any quinoa salad, leftover rice, risotto or even leftover paella to make vegetarian stuffed tomatoes for an entree, side, or appetizer. Vegetarian stuffed tomatoes are a great vegetarian dinner idea that you can serve as a side dish or as the main event. There are a number of simple vegetarian dinner ideas to help you get a healthy and home-cooked meal on the table without too much fuss. 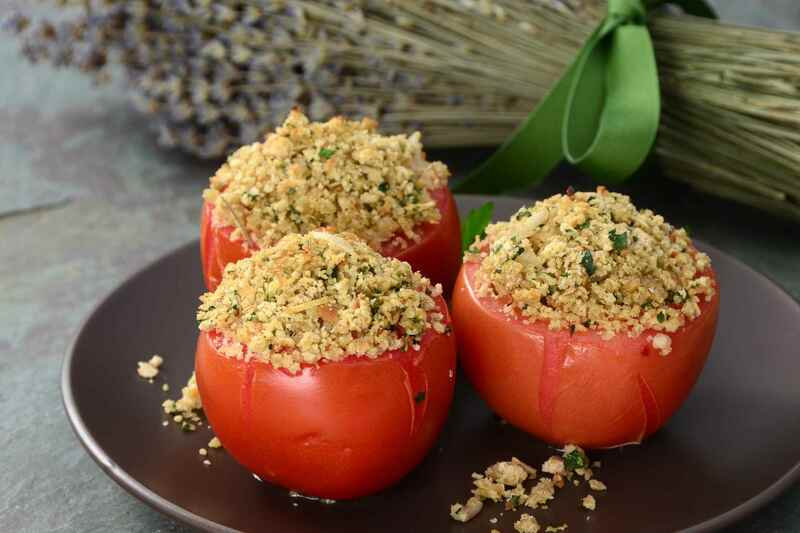 Look at these ways that you can make a vegetarian or vegan entree out of stuffed tomatoes. Use panko or regular breadcrumbs, fresh grated Parmesan (or Romano) cheese, toss it all together with some Italian seasonings and stuff it all into a tomato. It is really not all that hard to make stuffed tomatoes. If you want a little more depth of flavor, you can add some frozen green peas or maybe some lightly browned vegetarian meat substitute. Honestly, these breadcrumb-and-Parmesan stuffed tomatoes are delicious just the way the recipe intends. You can make vegan stuffed tomatoes with vegan cheese. This vegan stuffed tomatoes recipe is made with simple ingredients: leftover rice, chopped onion, and bell peppers and seasoned with a little garlic powder. This recipe may not win any gourmet food awards for its simplicity,​ but you will enjoy a simple, healthy, and satisfying dinner on the table. One of the best things about making stuffed tomatoes is that you can literally stuff them with anything including leftover quinoa, leftover rice, leftover fried rice, or even baked beans. This recipe, as it is originally written, includes ground turkey meat, but offers a vegetarian version that uses crumbled meat substitute.